In the 2015-16 Federal Budget, the government announced that it will amend the law to remove the income tax exemption available to government employees who work overseas to deliver Official Development Assistance (ODA). Under current arrangements, the income of Australian residents who work overseas for more than 90 continuous days and meet certain qualifying conditions exempts. The conditions include Australian government employees delivering ODA. The original purpose of the exemption was to avoid double taxation, but in many cases the employee now avoids income tax in both the source country and Australia. 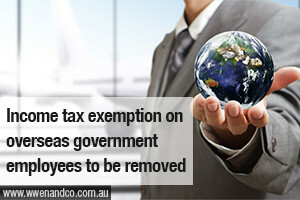 The qualifying conditions will be amended so that from 1 July 2016, Australian government employees who work overseas to deliver ODA will no longer qualify for exemption from income tax. Australian Defence Force and Australian Federal Police personnel and individuals delivering ODA for a charity or private sector contracting firm will maintain eligibility for the exemption.